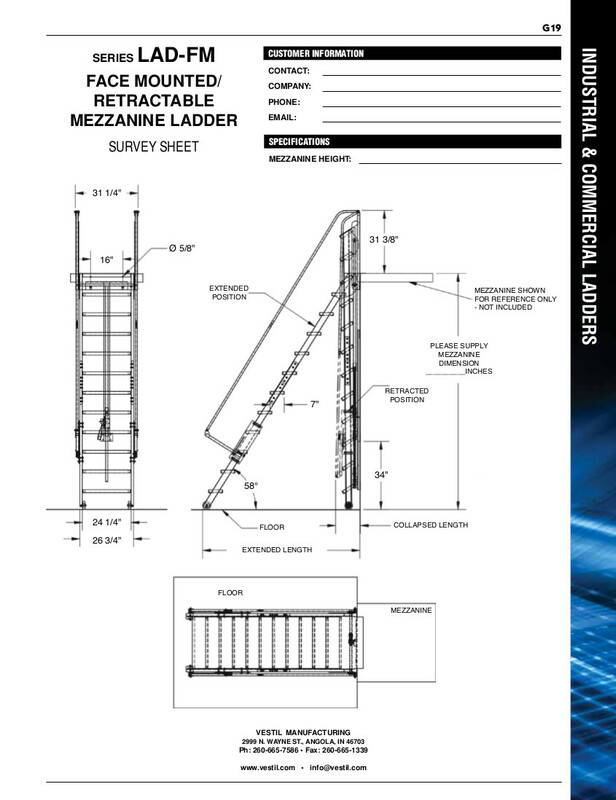 Vestil Mezzanine Ladders are ratcheted into climbing angle and back into stored position. The wheels roll on the ground when ratcheted and the handrails mechanically rise into climb position when ladder locks into position. Quickly extend and retract the ladder. The mezzanine ladder allows for quick installation with mounting bracket provided for bolt-on installation or welded installation. Steps are 24" wide. Minimum mezzanine height is 60". Maximum mezzanine height is 128". Collapsed distance from wall is approximately 15-1/2" for all models. Customer must provide their mezzanine height at time of purchase. Baked-in powder-coated toughness. Meets or exceeds all OSHA requirements. Ships knockdown, some assembly required. Survey sheet available, click here.